Introducing solid foods to your baby for the first time is a really exciting milestone (I never would have guessed liverwurst would be my daughter’s favorite food! ), but it can also be nerve wracking, especially when it comes to foods that commonly cause allergies. You might be uncertain when (or even if) you should introduce certain foods that could cause baby allergies. It gets even more confusing when you look at foods you might avoid yourself, such as peanuts or wheat. And if you have a family history of food allergies? It feels overwhelming! Is earlier introduction better? Should you wait until after the first year? Should you just start with skin prick testing? Let me reassure you mama—you got this! I had all these same questions when I started introducing solids to my own daughter. I dug deep into the latest research to find out the best practices for introducing potentially allergenic foods, and today I’m diving deep into common allergenic foods, how to introduce allergenic foods to your baby, and signs your kiddo has an allergy. In the United States, allergies—both to these 8 foods and others—are on the rise. Between 1997 and 2011, food allergies in kids increased 50%. And peanut allergies have tripled in kids between 1997 and 2008. The good news is the rise in allergies has led to a rise in allergy research, and today we know more about how to prevent allergies than ever before. Before addressing babies and food allergies, it’s important to note that not every negative reaction to a food is a true allergy. Food allergies are an immune response to a food entering the body. They cause an immunoglobulin E (IgE) response and can result in hives, anaphylaxis, difficulty, breathing, and swelling. IgE food allergies usually develop in childhood (but not always) and usually can be decreased but can’t be completely overcome. Many people also struggle with food intolerances. 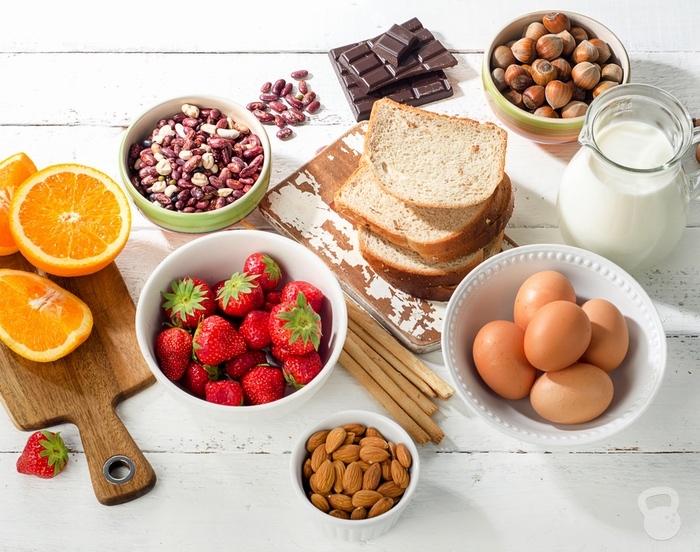 Food intolerances can develop at anytime in your life and can occur with any foods (including common allergenic foods), but when the body encounters a food it is intolerant to, there is no antigen-antibody response. The symptoms food intolerances can cause can be serious: bloating, digestive distress, headaches, skin rashes, fatigue, and more, but they aren’t an allergic reaction. Food intolerances are often a result of imbalances in the gut or conditions like leaky gut or SIBO. Food intolerances can often be improved or overcome by healing the gut. While food intolerances can be a serious issue, today I am specifically talking about food allergies (IgE). The process for preventing food allergies is different than the treatment/prevention of food intolerances, so this distinction is really important (especially when talking about baby allergies). Here’s the good news: Multiple recent studies point to the same conclusion. Early introduction of allergenic foods is better for preventing allergies. The most well-known research is the 2015 LEAP study, which focused on peanut allergies. The study found babies who had peanuts introduced before 12 months of age had significantly fewer peanut allergies at age 5 than those who didn’t get exposed to peanuts before turning one. A 2017 study found kids who weren’t fed eggs, wheat, or dairy until after age one were significantly MORE likely to have an allergy than those who had these foods introduced as a baby. Some research, like this 2016 study, showed that even earlier introduction—before 6 months of age—can significantly reduce the prevalence of allergies, too. This is really important because for years, the advice was to avoid giving your baby potentially allergenic foods in their first year. Some experts also called for extended exclusive breastfeeding (avoiding solids before one year), but new research is flipping this on its head! As I mentioned earlier, some practitioners used to recommend extending exclusive breastfeeding as long as possible to try and prevent allergies, which goes against what modern researchers have found about babies and preventing food allergies. But, new research also indicates breastfeeding is still really important for preventing baby allergies, it’s just not about delaying weaning or exclusively breastfeeding. Instead, what may be the most important takeaway from all this research is introducing food while you’re still breastfeeding might help prevent baby allergies. In fact, the age of introduction might not even be as important as continuing to breastfeed while you’re introducing foods, especially allergenic ones. A 2018 research review found special proteins found in breast milk may support the tolerance of solid foods, including common allergens. This same review concluded there was no benefit to pregnant or breastfeeding moms avoiding common allergens either. Instead, the best thing you can do while you’re pregnant and breastfeeding is to regularly consume potentially allergenic foods. Continue doing so as you introduce those foods to your baby, too. There’s another layer to consider when talking about baby allergies, too: gut health. A 2016 research review found both allergies and asthma are rooted in “microbiome deficiency” in early infancy. A baby’s microbiome is essentially all of the microorganisms (bacteria) that are populated the gut. The health of the microbiome plays a vital role in a baby’s health, and sets the stage for the development of the adult microbiome. Science has linked imbalances in gut bacteria with immune dysfunction and multiple chronic diseases. Do I Have to Introduce Allergens to Baby? 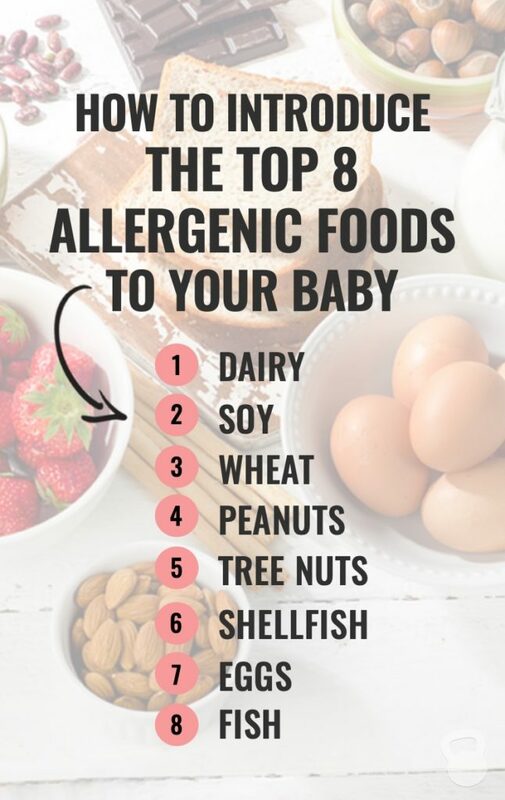 Whether you have a family history of food allergies or you just avoid some of the more common allergenic foods yourself, you may be wondering if you even need to introduce all of the allergenic foods to your baby. The common allergens don’t need to become staple foods in your baby’s diet, but it is a good idea to at least introduce them and continue exposure during the first year of life. Even if you’re strictly wheat-free at home, exposure to potential allergens at some point in your kid’s life is inevitable. Most importantly, the LEAP study showed that once immune tolerance to peanuts was established, even if kids didn’t eat peanuts for the following year, they still kept immune tolerance. This is important because it means introducing allergenic foods in the first year can protect your baby from an allergy for life, even if you don’t plan to make the food part of their regular diet. What about skin prick testing before introducing foods to try and prevent allergic reactions? For most babies, skin prick testing can lead to unnecessary food restrictions. The only exception might be if your baby has very severe eczema. Talk to your pediatrician in that case. Introducing the widest variety of foods in the first year, while you’re still breastfeeding, is the best way to support the development of your baby’s microbiome and prevent allergies. The best way to start introducing allergenic foods to your baby is by consuming them while you’re pregnant and breastfeeding. If you’re allergic to a food, you shouldn’t eat it. But if you avoid a food because of preference or even a mild intolerance it can be worthwhile to rotate these foods in occasionally while you’re pregnant (especially 2nd and 3rd trimester) and breastfeeding. As a side note, many women find that foods they are intolerant to no longer cause symptoms during pregnancy. So if you normally avoid wheat because it makes you feel bloated, you might find you can tolerate it just fine during pregnancy. This could be due to changes in the immune system during pregnancy. If your baby reacts negatively to a food that you eat when you’re breastfeeding (this happened with my daughter anytime I ate eggs), you may want to take that food out of your own diet while you focus on building up baby’s gut through breastfeeding and/or adding in a probiotic. Try reintroducing it later on to your own diet again and see how baby reacts. Once your baby no longer reacts to the food in breastmilk, you can try introducing it directly, ideally still before 12 months of age. When baby does start eating solids, first foods shouldn’t be the most common allergens. Instead, focus on iron, zinc, fat-soluble vitamins, and long-chain omega-3 fatty acids, which are the nutrients babies need most as they transition to solids. Learn more about the best first foods for baby here. Step 2: Start with a small taste, then wait five or ten minutes before offering another small taste. Observe for any signs of a reaction (see below). Step 3: Repeat Step 2 at the next meal. If there’s no immediate signs of a reaction, gradually increase the quantity of that food over the next few days and allow baby to eat according to your normal mealtime habits. Keep a close eye on baby for the two hours after introducing for signs of a reaction, and be aware that a reaction can occur anytime in the 24 hours following introduction. Once you’ve successful introduced the food and gradually increased exposure, you can continue to offer it to your baby as you would other foods. If baby has eczema or other food allergies, aim for 3 times a week exposure throughout the first year of life. Reactions can be mild to severe. Mild reactions don’t necessarily mean your baby has an allergy, they can just be a result of a new food interacting with your baby’s gut and immune system for the first time. Remember, baby’s immune system is still developing and many babies “outgrow” allergies in their first year of life. You baby may overcome this small reaction through repeated, small exposure—as little as a finger dipped in thinned peanut butter. Severe reactions are different, however. You should always talk to your pediatrician about severe reactions before trying to introduce the food again. And remember, always trust your gut and use your best judgement. If you feel you need to get medical attention, don’t hesitate. But don’t let fear hold you back either! Early and repeat introduction while you’re still breastfeeding is the best way we know to prevent allergies. Introducing allergenic foods can feel very scary if you don’t have all the facts. I hope this information has left you feeling empowered instead of scared of introducing allergenic foods. And don’t forget—introducing new foods to your baby doesn’t have to be intimidating! If you’re stressed or anxious, baby will pick up on that energy. If your baby doesn’t like one of the allergenic foods you’ve introduced, that’s OK. Continue offering it as you would other foods, and enjoy the process. Have any questions about introducing allergenic foods to baby? Ask away below! I have a question about introducing tree nuts. I have a seven month old and we just introduced peanuts last week and he did fine. This week we are introducing almonds. Do I need to make sure I introduce each tree nut separately following the three day protocol? I’ve heard of people having allergies to just walnuts or cashews and was wondering how to treat tree nuts when it comes to introduction–as one allergen or as many allergens as there are tree nuts. Thank you! Hi Lelan! I actually did them each individually for that reason. I did peanuts first, and then almond butter/almond flour baked goods. Once I saw she did great with the almonds, I was a little more casual with the other tree nuts/nuts. Hi! My baby’s face and chest turned red after eating both peanuts and egg yolk, she also seemed to be a little fussier in the few days following each introduction. I’ve been worried about trying them again. Is there a specific time frame I should wait before introducing them again? Thanks so much! I can understand why that might be confusing because flushed skin is normal for babies for a variety of reasons. It’s best to alert your baby’s doctor about this and see what he/she suggests. I’m not sure about yours or your baby’s medical history, and that may come into play here. Because the reaction isn’t technically a sign of an allergy, your doctor may suggest that you wait until the symptoms have completely disappeared and reintroduce a small amount again just as you did the first time.